b) North Eastern Institute of Science and Technology, Arunachal Pradesh. Life member of Assam Science Society. Life member of Assam Academy of Mathematics. Life member of Indian Mathematical Society. Member of World Fuzzy Sets and System Association. Life member of Green Guard a Society of Nature, Lakhimpur. Member of Bulletin of Pure and Applied Sciences. Member of Asom Bigyan Writers Association. President of Progyan Deep, an Assamesa Magazine for Children, Gauhati. Life member of Purbanchal Tai Sahitya Sabha. Member of Board of studies of Dept of Mathematics, Dibrugarh University. 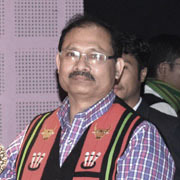 Member of Academic Council, Dibrugarh University. Member of Under Graduated Board, Dibrugarh University . A research level Book entitled “Fuzzy Modeling of Boundary Layer Theory” published by VDM Book publishing House Ltd., Germany, 2010. ISBN- 10: 3639299361 & ISBN- 13: 978-3639299366. A research level Book entitled “Continuity in Topological Spaces” published by VDM Book publishing House Ltd., Germany, 2010. ISBN- 10: 978-3-639-30482-4. A research level Book entitled “Fuzzy Rule-Based Modeling on River Study” published by LAP-Lambert Publishing House, Germany, 2011. ISBN -978-3-8465-3484. Edited Book entitled “Panindra Nath Gogoi” published by Purbanchal Tai Sahitya Sabha, 2011. Edited Book entitled “Ijeb Phukan Rasonawali” published by Purbanchal Tai Sahitya Sabha, 2011. Assamese Poetry Book entitled “Sonary Ghatat Nodi” published by Notunsur, 2005. Tax book entitled “A Hand Book on Mathematica Programming”, Dibrugarh University, Nov. 2011. ISBN: 978-93-81689-05-9. B C Chetia & G C Hazarika, "Effects of Fuzziness on dynamical similarity and Reynolds's number" in International Journal of Fuzzy Sets And Systems, Vol. 115, ( 2000 ), P 463 - 469. B C Chetia & G C Hazarika, "Fuzziness on Couette type fluid flow through a straight channel" in Bulletin of Pure and Applied Sciences, Vol. 19E ( No. 1 ) 2000; P. 81 - 91. B C Chetia & G C Hazarika, "The effect of Fuzziness on the Hagen - Poisuille theory of fluid flow through a circular pipe and turbulent flow through pipes" in Bulletin of Pure and Applied Sciences, Vol. 20E ( 2 ) 2002; P. 421 - 434. B C Chetia & G C Hazarika, "Effect of fuzziness on the approx. method due to the Th. Von. Karman and K. Pohlausen for 2D Boundary - layer solutions" in Mathematical Modelling, Mc Graw- Hill Publishing Co. Ltd., New Delhi, 2001. B C Chetia & D Gohain, "Acceptance single sampling plan with fuzzy parameter" in Journal of Assam Statistical Review, Vol. 22, 2009,No. 1-2, P. 137-149. B C Chetia, R C Jushi & S Gogoi, "Fuzzy rule-base Rainfall Discharge model of Jiadhal river basin, Dhemaji, Assam" in proceeding of changing face of Geography and challenges ahead, Cotton College, 2009. B C Chetia & S Gogoi, Fuzzy Logic based Real time flood forecusting model for River Jiadhal in North East India in International Journal of Environmental Enginnering and Management 2(2), Nov.,2011,p209-221. B C Chetia, Spatial object modeling in Fuzzy Topological space with application to Land used and Land Cover changes of Manas National Park in North East India, Advance in Fuzzy Mathematics, 6(3), Dec.,2011,p359-372. B C Chetia, S. Gogoi, Fuzzy Rule Based modelling on flood forecusting of Jiadhal River of Dhemaji District of Assam, India, Advanced in Fuzzy Mathematics, 13(3), 2011. B C Chetia, Fuzzy System approach on problems of flow in the wake of flat plate at zero incidences. International Journal of Fuzzy Mathematics and Systems, 8(1), 2011. B C Chetia, U N Gogoi, A Possibilistic approcach to thermal boundary layer theory, International Journal for Basic and Social Sciences, 2(3), 2013. B C Chetia, P Sabhapandit & K Pathak, On Cartesian Product of BE/CI Algebra, Journal of Assam Academy of Mathematics, (6), p33-40. B C Chetia & S Ahmed, On Fuzzy Supra Boundary and Fuzzy Supra Semi Boundary, International Journal of Fuzzy Mathematics and Systems, 4(1), 2014, p39-52. B C Chetia & S ahmed, On certain Properties of Fuzzy Supra Semi open Sets, International Journal of Fuzzy Mathematics and Systems, 4(1), 2014, p93-98. B C Chetia & H C Chamuah, Quantitative Fuzzy Topological relation of spatial objects to compute interior, boundary and exterior by induced fuzzy topology, International Journal of Multidisciplinary Educational Research, 4(2), 2015, p 214-227. B C Chetia, K Pathak & P Sabhapandit, Cartesian product of BE/CL- Algebra with essences and atoms, Acta Ciencia Indica, XLM(3), 2014, p271-279. B C Chetia & U N Gogoi, Fuzziness on Temperature Distribution and Couette Type Flow, Research Journal of Mathematics and Computing, 1(1), 2013, p 1-5. K Pathak & B C Chetia, On Homomorphism and Algebra of Functions on BE- Algebras, International Journal of Mathematics Trends and Technology, 16(1), 2014, p52-57. M Biswas & B C Chetia, Connectedness in Fuzzy Recombination Space, Journal of Globel Research in Mathematical Archives, 2(3), 2014, p95-101. H C Chamua & B C Chetia, Application of Fuzzy Topological Relation in Flood prediction, International Journal of computer applications, 122(7), 2015. State level Seminar of Assam Science Society was held at North Lakhimpur on 24th and 25th Oct’ 1998. 65th Annual Conference of Indian Mathematical Society held at A.P.S. University, Rewa, M P from December 20–23, 1999. And presented the paper entitle "Fuzziness on Couette type fluid flow through a straight channel". International Conference on Mathematical Modelling held at Deptt. of Mathematics, University of Rookree, U P, during Jan. 29 – 31, 2001. And presented research paper entitled “Effect of fuzziness on the approx. Method due to the TH. VON. Karman and K. Pholausen for 2D Boundary – Layer solutions". The above paper was accepted to present in the joint Conference of International Fuzzy System Association and North American Fuzzy Information Processing held in Vancover, Canada, during July 25th to 28th, 2001. Attended National Seminar in Lakhimpur P.G.T. College from 24–25 Nov 2006 and presented two papers. Workshop on Post–literacy Program, organized by Assam Science Society held at Mirza during 20th to 22nd 1993..
Workshop on Revue of H S Syllabus of Mathematics, organized by Assam Higher Secondary Education Council in the banner of Assam Academy of Mathematics during 2nd to 4th Feb.’ 1995. Workshop on Computer Programming, organized by I S I Colcutta at Assam University, Silchar during 13th to 23rd Oct., 2003. Workshop on Recent tends on application of Mathematics at D.U. , from 9-3-06 to 10-3-06. On Operationalisation Edusat in Academic Staff College on 10-08-2006. UGC sponsored National Workshop on Environmental hazards and disaster management at North Lakhimpur College, from 19th and 20th September, 2008. UGC sponsored Regional Workshop on Mathematical Laboratory at Dibrugarh University, during March 23-24, 2009. UGC sponsored National Workshop on Fuzzy Logic and its application at Lakhimpur Girls College, during January 29th to 30th, 2010. Participated in leadership development programme organized by Maastricht School of Management, Netherlands, 9th July, 2013. Participated in the Summer School of the International diploma in leadership in higher education from 1st to 11th July, 2013, Paris, France. Participated in the Workshop on innovations and best practices in Autonomous Colleges organized by National University of Education Planning and Administration, Delhi from 9th to 13th Dec, 2013. Participated in the workshop on science translation organized by NBT, India at North Lakhimpur from 9th to 11th Nov, 2012. Participated in the one day Symposium held at North Lakhimpur organized by Sahitya Academi on 1st July, 2012. Participated in the National level workshop on New trends in Mathematics in under graduate level held at Dhemaji College as resource person on 18th March, 2013. Participated as resource person in the Workshop on Semester system of education and its impact on teaching learning evaluation organized by Harhi College, Dhakuakhana on 29th March, 2013.